It is still very much a style statement to sip coffee in Khan Market. Centrally located in the capital city, Khan market is not only Delhi’s pride but also a star destination for international tourists as its ranked in top rated retail high streets in the world. No wonder this place, popular for books, food, and authentic Indian clothing and homeware is a popular shopping destination for foreign visitors. Not only that, Delhi’s famous writers, artists, actors, bureaucrats, journalists, politicians, and diplomats make for this hi street’s regular visitors. The 65-year-old market’s strategic location is what fuels its energy and maintains its elitist aura. Surrounded by high-profile destinations such as Golf Club, Lodhi Garden, Sujan Singh Park ( prestigious apartment complex), India Habitat Centre, India International Centre, Hotel Ambassador (Vivanta), Khan market’s premium tag remains unchallenged, given the growth of malls in Delhi as well as emergence of Gurgaon as a glamorous province. 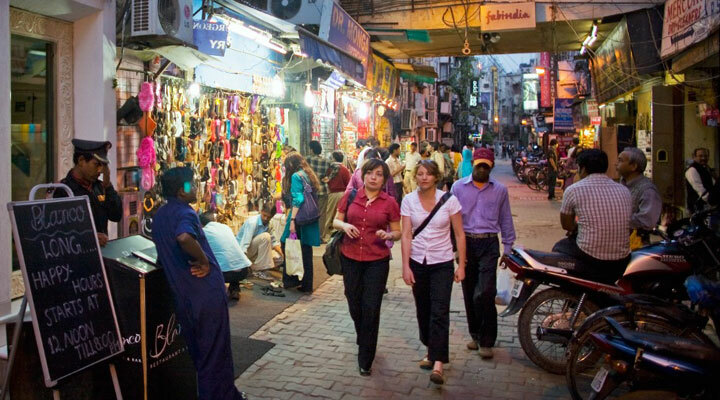 Khan market also commands city’s top retail real estate value. The market has a parking lot of its own and now also has metro (train) connectivity with an underground metro station opposite Ambassador Hotel (now Taj Vivanta). The hi street is great leisure time out. One can not get bored even strolling several rounds around the U-shaped market, giving ample scope of window shopping. Some people visit the place just to pass sometimes as it’s a quiet, safe and upmarket ambiance that relaxes one effortlessly. There is the lushness of greenery around, and any visitor feels rejuvenated spending time such a green environment and gazing at the splendor of different shops. Every store in Khan market are classes apart, whether you speak of Anand Stationers that offer handmade paper or Anokhi (a prominent store) for Indian ethnic outfits. Mehra Bros offers papier mâché ornaments, very much in style. In facts Anokhi, Big chill, cafe turtle, Khan chacha, Chonas, Good earth are very integral to the DNA of Khan Market. Book lovers have a lot to indulge in. The market has Full Circle Bookstore and Bahrisons. There are tons of newspaper and magazines being sold outside. Something that’s unique to this market is the collection of its products. Like, even the newspapers and magazines are those that one wouldn’t find normally around. They say the same for electrical goods. Likewise, the same review is given for books, music and one realizes nearly whatever one goes through in any stores, isn’t just simply the best but also a rare piece. And that’s what makes this market premium and enchanting. If a person enters a book shop, then one can stay there for 3 hours very easily. Most of the music that’s played on Radio is sourced from Khan Market. It would be nice if one is able to visit and check out kebabs at Salim’s Kebabs and Khan Chacha. Also, the momos opposite Lok Nayak Bhavan, a government office complex, are quite popular. That aside, there a bunch of others such as Cafe turtle, big chill and so on that’s great with international cuisines. Khan Market any day is a connoisseur’s delight. Even as an Indian one feels totally proud of the ensemble. It’s got the best and finest of every product category. Especially if you have foreign visitors over to your place and you want to show them the best of Delhi, then just bring them to Khan market.